All One Thread envisions working with UNESCO, governments, museums, academic institutions and embroidery guilds to study and document traditional patterns, many of which are being lost. We will promote the development of educational materials that tell the rich stories behind the patterns for schools, museums, or traveling exhibits. Do you have access to traditional patterns from your region? Send us your patterns or stitching techniques and we will archive them for future generations. Do you know a museum or university that would be an ideal repository for your nation’s embroidery patterns, designs and techniques? Introduce us and we will work together to establish or expand their existing collection. Interested in joining an AOT committee on safeguarding and preservation? Send us a note and we will be in touch immediately. While hand embroidery is still valued and practiced almost everywhere in the world, it has experienced a decline. Many reasons exist for the decline: machine embroidery is sometimes so excellent that the difference between hand- and machine-done is hard to detect; natural disaster and conflict interrupt traditional practices; the time of young people in today’s hectic world is consumed with electronic gadgets; young people are not attracted by the designs and styles of older generations; and the remuneration for hand-embroidered clothing, accessories and household goods is frequently so little that embroiderers are discouraged from doing it as an income-generating activity. 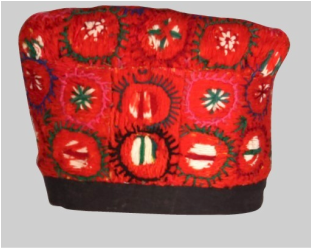 The objective of safeguarding and promoting indigenous patterns, designs and stitching techniques is of course related to several other All One Thread objectives. However, we also see this as a distinct objective. Special efforts should be made to document traditional patterns and stitching techniques, including the meaning or symbolism behind the use of colour and imagery, thread, needle and fabric type, and techniques used to create the beautiful clothing and household products worn and used by everyone from royalty to ordinary people. One example is the Japanese rozashi technique, an ancient needlework technique documented back to 700 AD. It is stitched on a ro, a silk gauze, and the stitches are upright. Another is khamak, from southern Afghanistan. This intricate form of embroidery is worked in silk and is inspired by complex Islamic patterns. The technique involves counting the threads of the fabric weave (hence cotton and linen are the best raw materials for this embroidery). AOT will support existing preservation efforts and initiate new ones wherever the possibilities present themselves. Through photographs, digitalization, paper copying and any other methodologies, we will join efforts to document the old patterns and techniques and to archive them for everyone to see and use now and in the future. Did you know that embroidery – along with other crafts plus music, dance, theatre and other aspects of “cultural heritage” – are protected by an international convention? UNESCO, the UN Educational, Scientific and Cultural Organization, is the repository for the 2003 Convention for the Safeguarding of the Intangible Culture Heritage. Let us know what you are doing or would like to do with respect to preserving!